Travelling with TUI Airways? Find out everything you need to know about TUI Airways baggage allowance, restrictions, fees and charges. Note: The baggage allowance will depend on whether the booking is for a package holiday or a flight only booking. Hand Luggage: 1 piece of hand luggage, 5 kg, 55 x 40 x 20 cm. On some holidays, you are entitled to 7 kg. This will be clearly shown whilst you are booking. On certain types of holidays, you have a bigger allowance of 20 kg. Hand Luggage: 1 piece of hand luggage, 5 kg, free of charge, 55 x 40 x 20 cm. Things like laptops, handbags and items bought at the airport must fit within your 1 piece of hand luggage. You must be able to lift this hang luggage into the overhead storage. Checked-in Luggage: You can book for checked-in luggage for an extra charge through the Flight Extras website. Premium Club: You have the option of upgrading to Premium Club and you’ll receive a luggage allowance of 23 kg as well as 7 kg hand luggage. Infants: under 2 years old, get a 10 kg luggage allowance. A pushchair can be carried on board free of charge. Please refer to the Flight Extras website for the exact charges for upgrading from the standard luggage allowance. You will need to call 0203 451 2695 at least 2 months before you travel to pre-book the equipment onto the flight. If the booking is not confirmed, the airline may refuse to carry your equipment at the airport. If you’re carrying diving equipment, and a diving certificate is shown at check-in, you will be entitled to an extra 5 kg luggage allowance fee. If more allowance is required, please check it in for an extra charge. If your instrument is larger than the maximum hand luggage dimensions (55 x 40 x 20 cm), you’ll need to check it in for an extra charge. Charges may vary depending on the season you’re travelling in. If you’re paying by credit card, you’ll also need to pay a credit card fee. Instead of having to worry about collecting your baggage at the carousel and the inflexibility of having to calling 2 months prior to your travels and paying expensive excess baggage fees at the airport – use My Baggage instead! All luggage is usually delivered within 2-3 working days, giving you a greater flexibility when travelling. 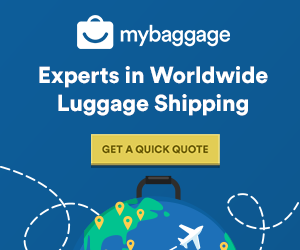 My Baggage provides a great low cost alternative to airline baggage, with a low cost, fast and convenient luggage shipping service which allows you to travel hands-free! It means you’ll save yourself a lot of time at the airport when you don’t have to check-in your bags, no waiting around at luggage carousels on the other side and ultimately, one less thing to worry about whilst you travel. To give you that extra peace of mind, My Baggage offers £100 free compensation cover on every single shipment and we have a dedicated customer support team should you have any questions or concerns.